WP User Avatar Pro is avatar creation utility to setup profile images on a WordPress site. 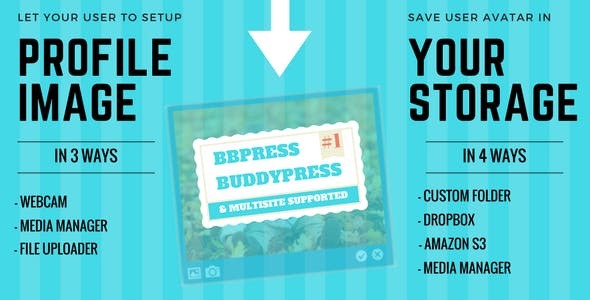 This plugin works with WooCommerce, BBPress, BuddyPress & multisite. Store the avatar files in Dropbox, Amazon S3, Media Manager, or a custom folder. Allow users to upload their custom avatar using file system or media manager. User can capture avatar instantly using web-cam. user can setup avatar from front end form as well. Admin can store user’s avatar in the cloud. Dropbox and Amazone S3 Storage are supported cloud. Admin can save users avatar in custom directory. Use [avatar] shortcode to display user’s avatar on the frontend. Upload Avatar using Buddypress’s change profile photo page. User Avatar will be shown on buddypress automatically. BBPress Supported – User’s avatar will be visible on bbpress pages automatically. WooCommerce Supported – Your customer can setup profile image using WooCommerce Edit Account Page. Multiple Readymade skins are available to apply on avatar form. User can setup profile image during registration. Admin can setup role based default avatar in the wordpress. Show First Letter as default avatar in the wordpress. User can crop and resize image before upload. Ability to disable Gravatar in case to show default avatar. Admin can setup global default avatar. This plugin is multi-lingual using .po file or WPML wordpress plugin. - New - Show/Hide avatar form on woocommerce edit account page. - Fix - Camera Issue fixed. - Fix - Media manager issue is fixed. - New - Ability to decide minimum crop area. - FIX - php 7 compatible issue fixed. - FIX - IOS CAMERA issue fixed. - FIX - DROPBOX Integration issue fixed. - New - Set first letter as user avatar. - New - Set default image based on user's role. - Improvement - Backend UI Updated. - Fix - Drag image was not working properly. - Fix - Avatar was getting lost on save profile. - Fix - Default avatar was not showing if gravatar is disabled. - Fix - Webcam was not working in safari. - Fix - Alt tags was empty in img tag. - Fix - Avatar was not showing edit profile page. - Fix - Avatar was not working in https is fixed. - Fix - Webcam and Media Manager was not showing. - Fix - Storage path was showing on save is fixed. - Fix - Extra profile fields was showing due to 'show_user_profile' action. - Fix - UI is improved. - Fix - Profile Image was broken on profile update is resolved. - Fix - Removed extra slashes from assets. - Improvement - Add user=current parameter to [avatar] shortcode to display currently logged in user avatar. - New - Woo-Commerce Registration and Edit profile supported. - Fix - Removed warnings. - Fix - Backend CSS was including at front-end which is resolved now.